The South African city of Cape Town is recovering from the worst drought in over a century. Policy makers are scrabbling to find ways to boost the city's water supply, to avoid facing the kind of water shortages it did during the summer of 2017/18. The Environmental Policy Research Unit's (EPRU) senior researcher Dr Jane Turpie recently contributed to this important debate. Earlier this year Turpie's firm, Anchor Environmental Consultants, did an analysis of the cost of the various approaches that the city plans to follow in its water resilience plan. Turpie's study shows that clearing alien and invasive trees from the key catchments around the city's main dams will yield a greater return on investment than many of the other proposed solutions. Local newspaper Business Day recently ran a series of articles featuring Turpie's analysis. At the height of last summer, as a three-year drought threatened to shut down Cape Town’s economy, scientists at the Council for Scientific and Industrial Research calculated that commercial forests and wild-growing invasive alien trees in the city’s main water catchments were drinking the equivalent of two months’ supply of city water every year. Clearing the plantations and the invaded areas in the primary catchments would push back the implementation of “day zero” — the city’s last-ditch emergency water-rationing measures — by 69 days, based on the city’s goal at the time of limiting collective use to 500-million litres per day. 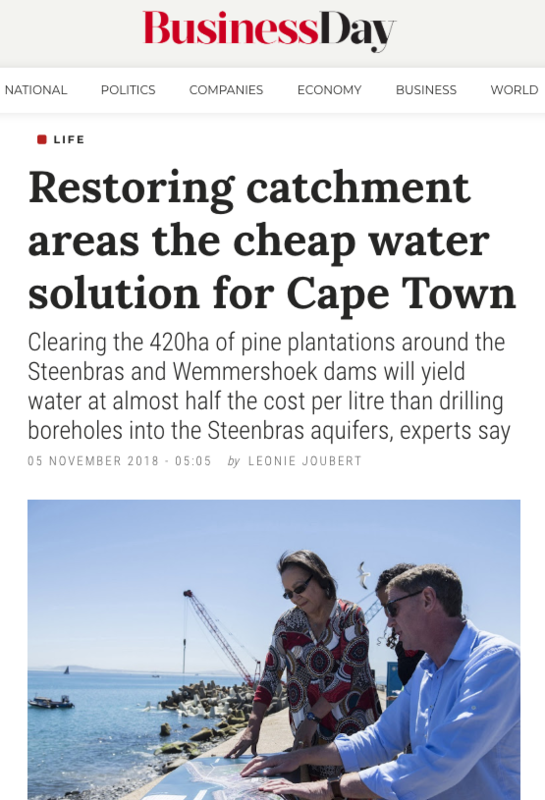 Another study, produced for international civil society organisation The Nature Conservancy (TNC) and due for release in November, shows that a 30-year programme to clear and maintain the ecological infrastructure of these catchments will be a cheaper way of securing water for Cape Town than building the desalination plants that are part of the city’s water resilience plan. This resilience strategy includes sinking 16 boreholes into aquifers around the Steenbras Dam, about an hour’s drive east of the city. According to TNC SA director Louise Stafford, preliminary figures show that this will yield water at an estimated cost of about R5.94 per kilolitre. This figure is calculated based on a City of Cape Town report that estimates the cost across all its groundwater projects, rather than figures for the Steenbras Dam boreholes specifically, which do not appear to be available. It does not include the possible additional cost of cleaning minerals from the water, should it be necessary. This figure is a little more than double the cost of the expected yield that will come from decommissioning commercial forests, clearing invading alien plants and restoring the catchments for the next 30 years. According to Dr Jane Turpie, a resource economist at Cape Town-based Anchor Environmental Consultants who led the TNC study, an investment of R650m to clear and maintain the area free of invasive plants over the next three decades will yield water at an average cost of R2.38 per kilolitre. Turpie’s analysis compares the cost implications of various of the city’s water security strategies, including hard-engineered and technical solutions — building new dams, installing desalination plants, drilling boreholes — with measures such as restoring ecological infrastructure through clearing invasive and alien forests from the catchments. The study concludes that clearing and restoring the main sub-catchments of the city’s water supply dams would give a better return on investment than other means of boosting water supply, and “should be given high priority”, according to Turpie. The City of Cape Town has not released its own estimated cost-per-litre of water for the Steenbras boreholes, and would not verify Turpie’s figures. Executive director of informal settlements, water and waste services Gisela Kaiser would also not confirm the overall cost of the Steenbras drilling project, or comment on questions relating to the quality of the water that might come from these boreholes. However, Nicky Allsopp, of the South African Environmental Observation Network, which is part of a stakeholder process that has helped inform the city’s decision-making on its water strategy relating to aquifer extraction, confirmed that the municipality has not released exact figures. It is difficult to make an accurate calculation based on the city’s budgets and borehole tender documents that are currently in the public domain, says Allsopp. The city also does not know what the quality of the borehole water will be and if it will need additional cleaning before it is fed into the Steenbras Dam. It is unclear whether the city has factored into its own risk assessment the likely negative impact on the surrounding wetlands, owing to a lowered water table as a result of the aquifer extraction, says Allsopp. Should the wetlands surrounding the dam begin to dry on the surface in response to a lowered water table, they will be less able to absorb and filter rain they would otherwise feed into the dam. Kaiser confirmed that Cape Town does plan to clear its commercial forests around the Steenbras and Wemmershoek dams, as part of a longer-term strategy. Together, these plantations cover about 450ha of catchment. The 350ha in the Steenbras catchment, which according to Turpie’s analysis use up double the amount of water than the trees in the invaded areas of the catchment, are on track to be cleared “within three years”. The remaining 70ha in the Wemmershoek Dam are expected to be cleared by the end of 2019. Clearing invasives does form part of the city’s broader water supply strategy, although the “details will only be finalised towards the end of the year”, says Kaiser. At a recent stockholder meeting, the city ranked its various supply strategies by cost, with desalination as the most expensive option for securing water, followed by water reuse and drilling boreholes into aquifers. It acknowledged that clearing of invasive plants is the cheapest intervention. However, it has not given comparative figures on what the cost of water will be for the engineered solutions, compared with clearing, restoring and maintaining the water catchments. Commercial forests in the Western Cape are the original seed-source of the plants that have escaped farming practices and invaded the surrounding landscapes. Plantations and escaped aliens remove significantly more water from the system than the indigenous fynbos vegetation, reducing groundwater and stream flow. They also contribute to greater fire hazard and cause soil erosion, which impacts on water quality. The Biodiversity Act makes it the responsibility of landowners to clear invasive plants and manage commercial forests that occur on their land, as well as restore catchments after clearing. In the Western Cape, the responsibility for the key catchments falls across a range of landowners. Some is on private property, while some occurs on land owned by various government departments and bodies, including the department of agriculture, forestry & fisheries, CapeNature and the City of Cape Town. In 2015, the department of agriculture, forestry & fisheries began a process of clearing 45,000ha of plantations in the catchments falling on its property in the province. However, it has since replanted 22,500 of those hectares, while the remaining 22,500ha have not been maintained, according to TNC’s Stafford, resulting in invasive pines regrowing in the catchments, which now increases fire hazard and water loss.